Who is affected by Turkey? With the news about the drop in the Turkish lira lately, we were interested in which companies may be affected by a potential economic downturn in Turkey. We looked at companies’ disclosed geographical segments for specific disclosures about Turkey. The Table below shows revenue reported in 2017 to come from Turkey and the percentage it represents out of total revenue. Looking at the table, we can see some companies that stand out, like ArcelorMittal (MT), a steel and mining company which reported almost $2 billion of Turkish revenue. Although less than 3 percent of total revenue, it is a significant amount. A 30 percent decrease in that revenue stream could translate to about 20 percent of the company’s net income. 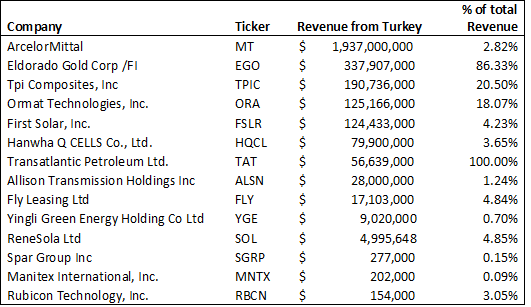 The vast majority of Eldorado Gold Corp.’s (EGO) revenue and all of Transatlantic Petroleum’s (TAT) revenue is reported to originate in Turkey. If you are interested in knowing more about Transatlantic Petroleum’s (TAT) business structure, you can check out its business description on Calcbench’s disclosures page. Another interesting question is the assets held in Turkey. Eldorado Gold (EGO) reported $835,422,000 worth of assets in Turkey, more than 16 percent of total assets. Westwater Resources (WWR) reported $17,979,000 of assets in Turkey, which represents more than one-third of its total assets. All this information was obtained from Calcbench’s breakout query. Calcbench Professional users, who really want to geek out with the data, can go to Calcbench’s Raw XBRL Query and search for XBRL dimension members that include “Turkey”, yielding companies that report information relating to business in Turkey. This would include companies like Banco Bilbao Vizcaya Argentaria S.A. (BBVA), Chemical & Mining Co. of Chile Inc. (SQM), Hormel Foods (HRL), Unilever (UN), Vodafone Group (VOD) and many others.